There is a way to make artificial intelligence (AI) work for the sector of the business process outsourcing (BPO), amidst threats that this technology posts on our major services industry, the country’s trade chief said. A product of the fast pace changes in technology, AI has presented itself more than just a new technology but as a threat to the current employees servicing the service export industry and the BPO, including the contact centers. 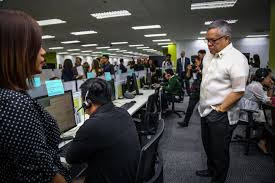 “Let us retool and reposition the nature of the current jobs in the industry,” said Department of Trade and Industry (DTI) Secretary Ramon Lopez, in the course of pessimistic prediction that AI could potentially diminish 45 to 50% of the approximately 1.2 million Filipino employees of the BPO industry. Sec. Lopez cited these possible solutions coming from his recent collaboration with Dr. Dado Banatao, a renowned Filipino technology entrepreneur based in Silicon Valley, in order to minimize the impact of AI on job displacements. Together with the Department of Science and Technology (DOST), the Commission on Higher Education (CHED), the Philippine Association of State Universities and Colleges (PASUC) and the Unite States Agency for International Development (USAID), the group is currently working on building an inclusive, innovation ecosystem (government-academe-industry network) that will infuse science and technology, and innovation in industries including agriculture and services. The AI technology enables computers to provide answers or solutions to problems raised in contact center transactions. Through programming, and deep learning technology, several databases are processed at faster speed and the computer processors are able to respond and recommend actions to callers. “We need to train affected BPO employees and strategically orient them on the emerging technology requirements of the industry that will enable them to continuously improve job performance. In other words, making use of technology in their jobs rather than being displaced by it,” said Sec. Lopez. “In simpler terms, we will endeavor to make this new technology work for them,” he added. The trade chief said that intensive education and training programs for those in the industry should be developed soon by the academe, government and industry innovation ecosystem to ensure least manpower displacement. He also underscored the need to develop an inclusive, innovation-led industrial ecosystem that will upgrade the competitiveness of the Philippine core sectors, including the services sector, in a bid to improve productivity, output generation. This is in line with President Rodrigo Duterte's agenda to build competitive industries that will generate more jobs and income, reduce inequality and give a more comfortable life for every Filipino, according to Sec. Lopez. DTI and DOST will lead the convening of all enablers in the innovation ecosystem to map out the overall framework and programs to be implemented. “There is a need to strengthen curriculum towards computer science, engineering, data science and AI application design, among others. This effort is also deemed to be inclusive as disqualified BPO applicants and retrenched agents will be retrained for AI application development that will eventually enable them to get jobs,” Sec. Lopez concluded.